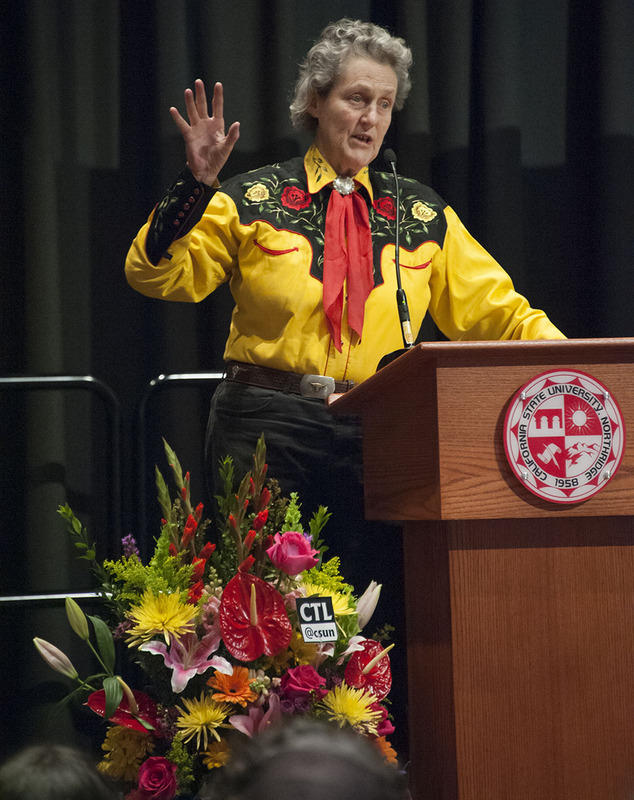 Temple Grandin is a spokesperson on behalf of autism advocacy, and came to CSUN as a part of the Education on the Edge series. Photo by Luis Garcia. CSUN President Dianne F. Harrison introduced Temple Grandin, whose life became the subject of an HBO movie. Photo by Luis Garcia. 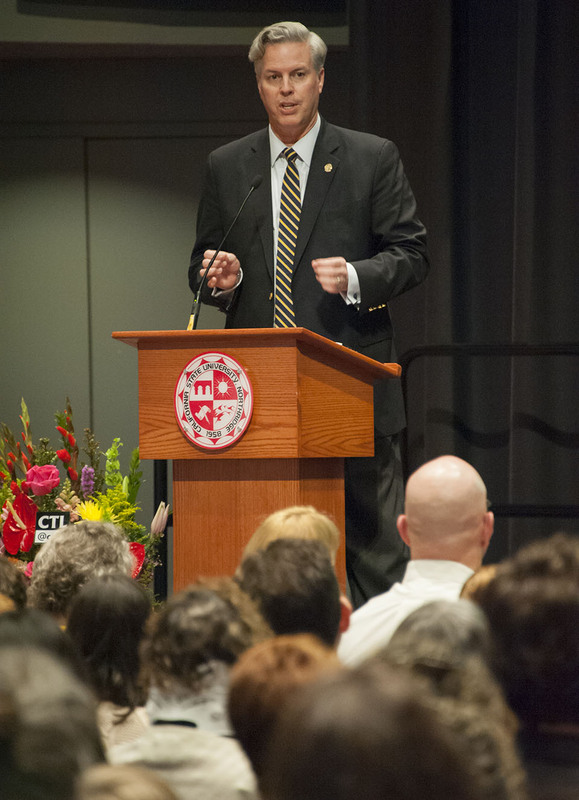 CSUN's Michael D. Eisner College of Education Dean Michael Spagna also introduced Grandin's Education on the Edge talk. Photo by Luis Garcia. California State University, Northridge had the distinct pleasure of welcoming world-renowned autism spokesperson Temple Grandin on Feb. 6 as part of a series of lectures and workshops on modern-day education and accommodating all types of thinkers entitled Education on the Edge, which was presented by the Center for Teaching and Learning. The lecture was open to anyone in the community, and people far and wide, including educators in training and USC students, came to hear Grandin speak. A well-known figure within the autistic community, Grandin was diagnosed with autism when she was four, and doctors recommended she should be institutionalized. Her parents refused to follow the advice, and helped Grandin to develop her speaking ability. As one of the first people to talk about their own experiences with autism and how it affects them, Grandin was able to develop many innovations to help those with autism, such as the hug box, a deep-pressure device designed to calm hypersensitive people. She was also the subject of the decorated HBO biopic, Temple Grandin, which details how she used her perspective with autism to rise to prominence in the field of animal science. The lecture was preceded by an introduction from Special Education Professor Wendy Murawski, who was joined on stage by a number of people whose lives had been affected by autism. Among them was Matador alumnus Tom Island, who explained how Grandin’s work had inspired him to step away from his job in corporate America to become an advocate for those with autism. The lecture focused primarily on the different types of thinkers that the world produces today, and society’s tendency to practice label-locked learning, whereby each student is sorted by what they cannot do, instead on how to build upon their strengths. Grandin spoke about how accommodating every individual through unique, case-by-case education could yield some of the greatest minds of this generation. She used many famous examples, such as Thomas Edison, Elon Musk and Steven Spielberg, all of whom exhibited traits of autism, and did not function well in the traditional education system, to demonstrate how these thinkers go on to achieve great success if they are given the right tools. Another key subject of the talk was the lack of focus on the process. Grandin explained many educators become frustrated that students cannot reach the goal set forth, when they should really focus on is a common goal for all students to work toward. 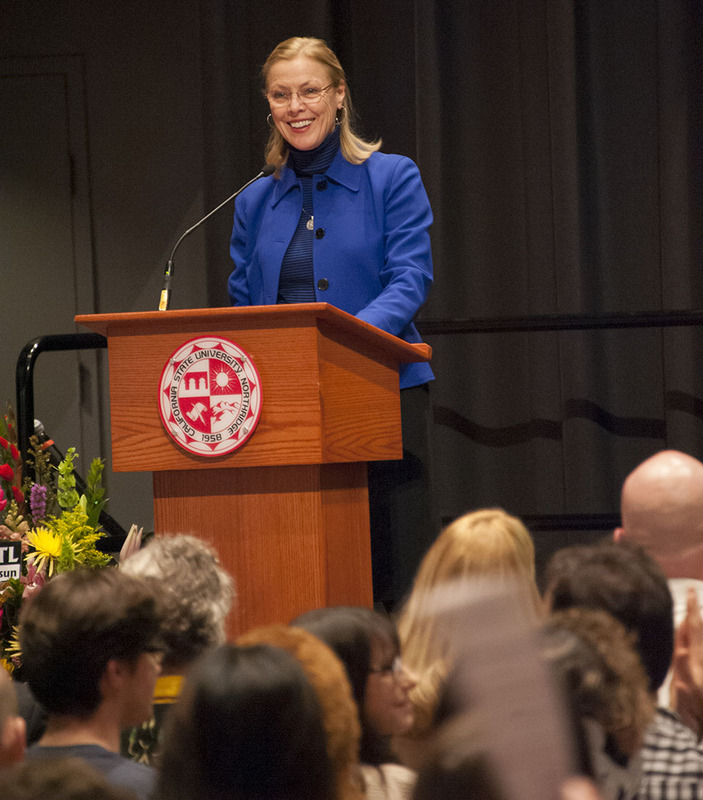 Jennifer Keresztes, who joined Murawski on stage before the lecture to discuss her son’s journey with autism, left inspired by the talk and how it could help with her son’s development, and commended CSUN for hosting such an event.